A “War on Drugs” approach to marijuana is ineffective and counterproductive. It simply doesn’t make sense to spend limited resources going after individual non-violent drug users. But the other extreme – legalization – is also a serious mistake. 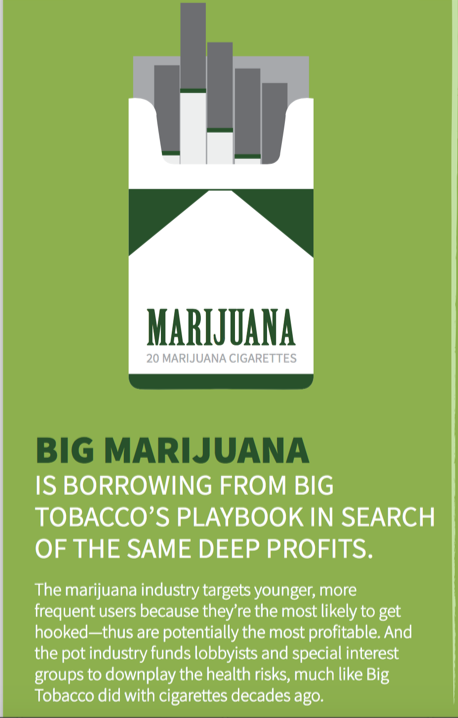 Commercializing marijuana will create the next “Big Tobacco” industry of our time. A new industry of lobbyists and special interests intends to put profits and special interests over public health and safety. Now is the time to stop and ask if we are sure we’re moving in the right direction on marijuana. In states that have legal marijuana, the black market continues to thrive, youth drug use is increasing, and the number of fatal drugged car crashes is skyrocketing. No amount of tax revenue can outweigh the social costs citizens are already being forced to pay. Science and evidence should guide our approaches to marijuana laws, not ideology or profit. And the research is clear: today’s marijuana is higher in potency, is driving treatment admissions for addiction, and making it harder for our workforce to compete globally. We can reform our nation’s criminal justice system without commercializing a drug we know to be harmful. It’s time to have an honest conversation about marijuana before it’s too late. Why do you oppose marijuana legalization when alcohol – a more dangerous drug – is already legal? Didn’t you learn from prohibition? Keeping drugs illegal creates a black market, and drug dealers don’t card kids. Doesn’t it make more sense to tax and regulate marijuana? Most Americans now favor legal marijuana, are you saying we should oppose the will of voters? You’re fighting a losing battle. Why do you even bother opposing marijuana legalization? What about states’ rights? In states that have already passed this measure, why should the federal government hamper a now-legitimate business industry? Who died and made you guys experts on pot? Do you hate rock music too? Get a life. If you’re against criminal records for marijuana, why don’t you support marijuana decriminalization? Scheduling: Is it really fair to put marijuana in same category as heroin and LSD? Are you pleased that the Trump Administration has signaled increased enforcement of marijuana laws? Where does SAM’s funding come from? Aren’t you funded by Big Pharma or the alcohol industry? Ok, so you oppose recreational marijuana legalization. What about medical marijuana? You’re not heartless, are you? Isn’t drug testing in the workplace discriminatory and hindering companies willing to hire qualified candidates? Is marijuana really a “gateway” drug, or is that just a scare tactic? Does SAM reject law enforcement as a solution? Does SAM believe in a “War on Drugs”? Why isn’t SAM putting forth very specific proposals for states and localities? How is SAM set up? Why do you oppose marijuana legalization when alcohol - a more dangerous drug - is already legal? Alcohol is not legal because it is safe; it is legal because most of Western civilization has used the drug for thousands of years. By contrast, marijuana has always been used by a small minority of the population. Drug laws keep rates of use down, thereby lowering the negative consequences for communities. Alcohol and tobacco – two legally available drugs – provide a good example, since Americans use them far more frequently than illegal drugs. Alcohol is in and out of your system within 24 hours; marijuana’s effects last much longer. Research has found that marijuana abusers self-report far worse outcomes than alcohol users, including more problems at home, work, or school and more mental health problems. Evidence also finds that people often use alcohol, marijuana, and tobacco together. Rarely do users substitute alcohol for marijuana. In fact, rates of alcohol sales continue to rise in states that have legalized marijuana. States that have legal marijuana continue to see a thriving black market and increasing rates of youth drug use, providing evidence that this theory of “tax and regulate” does not fare well in real life. People like going for the cheaper product. Untaxed marijuana on the underground market will always be attractive. And what about kids under 21, or those looking for pot after opening hours? People don’t just smoke marijuana from 9 to 7. Also, drug cartels are widely diversified businesses that make money trafficking in humans, cocaine, heroin, meth, extortion, intellectual property theft, etc. Marijuana is a small portion of their overall business. It would be naïve to suggest that cartels would cease to exist even if marijuana legalization eliminated the black market. Science and evidence – not public opinion or ideology – should drive public health and policy in America. While it is true an increasing number of Americans support legalizing marijuana, there is no evidence to assert that marijuana legalization is an issue most – or even a substantial number – of Americans care very strongly about. A recent Gallup poll found that the top issues Americans care most about are the economy, terrorism, and foreign policy. Marijuana legalization didn’t even register in the poll. The surprise results of the most recent presidential election demonstrate that anything can happen, and when it comes to controversial issues, public opinion can swing back and forth. Moreover, in many places that voted for marijuana, we are now seeing evidence of “buyer’s remorse” after the proliferation of marijuana shops and advertising in communities. In Colorado, California, and Oregon, the majority of towns, when given a choice, have rejected pot shops at the polls. Large percentages of Americans still oppose marijuana legalization, and there are many Americans who feel that they are being shouted down in the debate about marijuana. Every day, we hear from communities who are concerned about the proliferation of marijuana in their neighborhoods, schools, and workplaces. Our job is to give a voice to the voiceless in this debate: experts, public health and safety officials, concerned parents, and the business community, all of which deserve the opportunity to contribute to an informed public debate on this issue. Marijuana legalization is not a states’ rights issue because the effects of legalization quickly spread into neighboring, non-legal states. Since Colorado legalized, marijuana has poured into nearby states – it even got so bad that Nebraska and Oklahoma have sued Colorado for exacerbating their in-state marijuana trafficking operations. Moreover, this issue has already been settled by the courts. In Gonzales v. Raich, a 2005 case regarding federal enforcement of laws concerning marijuana plants in someone’s yard, the Supreme Court ruled 6 to 3 that federal law supersedes state law in enforcing drug statutes – even in states where marijuana is legal. Our opposition to marijuana legalization is like previous opposition to Big Tobacco in this country. It isn’t rooted in morality or outdated anti-drug ideology. We started SAM because we believe that science and evidence – not special interests or corporations – should drive marijuana policy in America. That’s why top research scientists throughout the country have joined our board and our mission. Today, many public institutions and major media organizations are failing to serve as independent watchdogs to this growing industry. So even in states that have legalized marijuana, we will continue to stand up for smart, evidence-based reforms and make sure that regulators, politicians, and special interest groups are held accountable for the promises they made to voters. We do support laws that remove criminal sanctions for low-level marijuana use, but the overall objective of drug policy should be to discourage drug use. Any proposed laws removing criminal penalties must be paired with requisite investments in prevention, treatment, and drugged driving enforcement. Decriminalization is also a confusing term, often inadvertently or purposefully used to advance legalization. Non-violent drug offenders – regardless of the drug – should not be saddled with criminal records that would imperil their recovery and reintegration into our communities. Still, we also know laws discouraging drug consumption work to keep rates of use down. That is why we support evidence-based reforms that discourage use while avoiding criminal penalties. There are a wide array of smart-on-crime alternatives that remove criminal penalties for smoking marijuana including drug courts, pre-trial diversion programs, and probation reform. Communities are healthier and safer when these reforms are coupled with prevention and treatment programs. The scheduling of drugs is not a “harm index” or directly used to determine criminal penalties for drugs. Scheduling is not synonymous with the danger of a drug. Rather, it is a technical legal term that categorizes drugs according to their potential for abuse and accepted medical value. Marijuana meets the technical definition of Schedule I because it has a high potential for abuse and has no FDA-approved use. Rescheduling is also a source of major confusion. Rescheduling marijuana – while symbolically important for special interest groups – would not have much of a real-world consequence in terms of reducing criminal penalties. Recreational use of Schedule II drugs is still illegal and can come with significant criminal liability. Still, we support efforts to increase access to marijuana for research to help the FDA find additional therapeutic uses for the drug. SAM published a six-point plan in 2015 that called for changes such as allowing more licensers to grow marijuana for research purposes, and establishing compassionate research programs for the seriously ill.
No. SAM is funded by small family foundations (with no interest in the opioid, tobacco, alcohol, or prison industries) and individuals affected by drug use and its consequences. SAM does not receive a dollar from the opioid, pharmaceutical, alcohol, or tobacco industries – unlike some pro-legalization groups like Law Enforcement Action Partnership (LEAP), which takes money from Big Tobacco. Yeah. We make annual disclosures regarding our funding sources every year. There are far too many Americans who suffer from life-threatening, debilitating chronic illness. Patients deserve to know that we are doing everything possible to help alleviate their pain in a safe, regulated way. Clearly, there are components of cannabis that provide therapeutic effects. However, the smoked form of marijuana does not meet the standard as safe and effective modern medicine. Smoking the plant is not an efficient delivery system, as it is impossible to measure exact dosage and contains hundreds of additional components that could have adverse or unknown effects. Smoking the raw form of marijuana is akin to smoking opium to get the effects of morphine, or willow bark for pain relief already available as aspirin. There is an urgent need to support expanded research for medical marijuana, and we support those efforts, so long as they are studied and approved the way we do all other medications. The bottom line is that we encourage component treatments that are safely FDA-approved, prescribed by a physician, and dispensed by a pharmacy. America deserves to have a healthy, strong workforce ready compete in an increasingly competitive and global economy. Research demonstrates that workplaces with lower rates of drug use have employees that are more productive, have lower rates of absenteeism, fewer accidents, and are better prepared to meet the challenges of an increasingly globalized economy. Drug testing is actually making hiring decisions less discriminatory. Studies have shown that in places where drug testing is more common, African-American employment rises. This is because there’s an often-subconscious perception among employers that African-American candidates use drugs at higher rates than whites, but when drug tests can firmly prove who is and isn’t using, hiring becomes more equitable. Drug testing is a matter of public health and safety – we wouldn’t want our kid’s school bus driver high, or our pilot stoned. Everyone wants to come home with the same number of fingers and toes that they left with in the morning. The American workforce should be as effective and clear-minded as possible, especially in today’s competitive global market. Do most people who use marijuana go on to other drugs? No. But do most people who use other drugs start with marijuana? Most definitely. A wide array of research has confirmed links between marijuana use and other drugs. While it is true most marijuana users won’t go on to use other drugs, research demonstrates that 99% of those addicted to other drugs started with alcohol and marijuana. Marijuana users are also three times more likely than non-users to become addicted to heroin, and a 2017 National Academy of Sciences report found a statistical association between marijuana use and the development of substance dependence for other drugs like opioids and heroin. It’s also important to keep in mind that marijuana on its own is harmful. 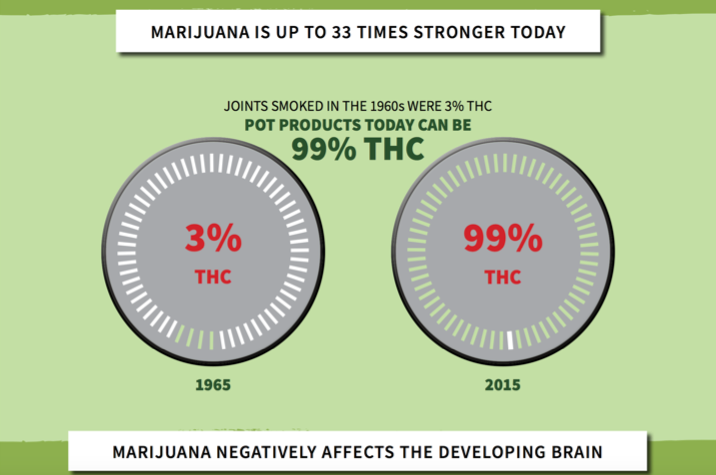 The average potency of marijuana has skyrocketed since the 1970’s and research demonstrates it is associated with substance use disorders, drugged driving crashes, lower IQ, and other negative consequences. Today, more young people are voluntarily seeking treatment for marijuana addiction than for all other drugs combined, including alcohol. No – law enforcement is part of a balanced solution to the marijuana problem. In fact, smart law enforcement can reduce crime as well as direct people to treatment. Drug courts, mental health courts, and projects like Project HOPE all have law enforcement as a central component. SAM believes that prevention and treatment should receive more funding, but that is not to say that law enforcement isn’t part of the solution. SAM does not use the term “War on Drugs” (first coined by the media over a hundred years ago) because it is outdated and insufficient as a term to describe the effort to reduce drug use and its consequences. War is a poor analogy as it implies there is a defined end and an enemy. All generations need to be educated about the harm of drugs. Rather than a “war” analogy, SAM supports a balanced public health effort to reduce the use and consequences of marijuana. SAM wholeheartedly believes that we need to fast-track the FDA process to extract non-smoked medications from the cannabis plant. SAM also believes that in the meantime, before we have more cannabis-based FDA-approved medications, FDA and HHS should administer a program whereby the truly sick and dying can receive yet-to-be approved, non-psychoactive, non-smoked components of marijuana under a special research program. But rescheduling marijuana is neither necessary nor desirable for those actions to happen. Rescheduling marijuana would do nothing to allow for more cannabis-based medicines. In fact, cocaine is Schedule II today and is not allowed in a widespread fashion. Rescheduling would simply be a symbolic victory for advocates who want to legalize marijuana. We’re getting there. SAM was put together because of the need for a more responsible conversation about marijuana in the U.S. that rejects both extremes – incarceration and legalization of marijuana. SAM is going to solicit specific ideas over the next year as to how localities and states can better deal with marijuana in a health-oriented way. SAM is governed by a Board of Directors. It is a 501 c3 non-profit organization. We also have state affiliates and advocates.